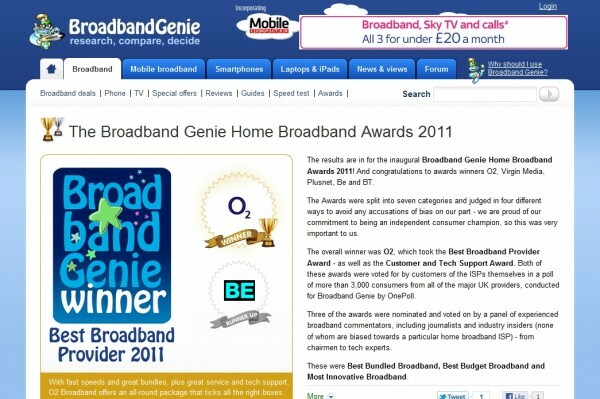 O2 and Virgin Media took two awards each of the seven on offer in the first Broadbandgenie.co.uk Home Broadband Awards, announced in February. O2 was awarded Best Broadband Provider 2011, as well as the Best Broadband Support Award. Both awards used independent data provided by OnePoll, which surveyed more than 3,000 customers across all of the UK’s leading broadband suppliers. Virgin Media landed both Fastest Broadband Provider and Best Bundled Broadband. The Fastest Provider award used data from almost 40,000 speed tests from www.broadbandgenie.co.uk – in partnership with Think Broadband. Best Bundled Broadband was voted for by a panel of industry experts, as were Best Budget Broadband (won by Plusnet) and Most Innovative Provider (BE Broadband). Commenting on the awards, Broadband Genie editor Chris Marling said: “We spend every day comparing broadband products, advising consumers on how best to find the right deals and listening to their feedback, so these awards seemed like an obvious next step. Why Choose an Android Tablet?